Managing a set of change initiatives through a portfolio management approach is relatively new for some organizations. This approach is drawn from the portfolio project management approach by dividing a set of initiatives into different groups. This then becomes more manageable from a workload perspective. Portfolio project managers are focused on investment funding, program management, governance, project execution and resource management. 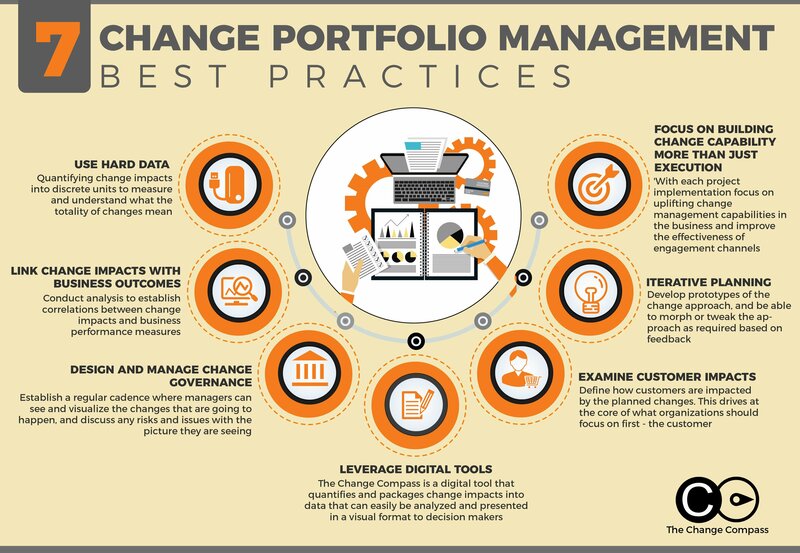 For portfolio change mangers, there are similar focus areas such as change program management, change initiative execution, resource management and quality assurance. However, there are also several marked differences, including focus on business change governance, business change capability, change leadership, and change tools and methodology. In practice, there is often a wide range of practices in the service delivery and model of portfolio change management. Some focus purely on supporting project delivery, and in process fail to uplift business change capability. Others tend to focus on general change capability through training and development and very little on change governance and supporting strategy implementation. So, what are some of the best practices in effective portfolio management? How does the change portfolio management function position itself to be strategic, value-adding and seen as a driver of business results? Here are 10 best practices. A lot of change professionals often shy away from data. We prefer to focus on behavior, leadership, mindsets, norms and culture. Whilst the ‘soft’ things may matter we need to be comfortable in working with data. Peter Drucker’s famous saying goes ‘What get’s measured gets done’. Disciplines with a strong focus on data usually have a strong seat at the business table. For example, Finance, Operations and Sales. Even Marketing is not just about creative ideas and concepts, but there is a strong focus on cost, revenue forecast and customer responses. Armed with data that drives business decisions and you get a strong seat at the decision making table. What types of data should portfolio change managers focus on? The standard change measures include training attendance, stakeholder ratings, and arbitrary business readiness ratings. To really demonstrate value, portfolio change managers need to turn change management into a science and be able to quantify change. Change Impacts is one great example. By quantifying change impacts into discrete units one can start to measure and understand what changes are and how they move over time and across different parts of the business. Continuing from the previous point – armed with quantitative change impact data, the portfolio change manager is able to analyze the data to find any correlations between change impact data and business performance data. This can become a very powerful picture to take to the senior management team – drawing out the impact of changes on business performance. Based on data from The Change Compass. An organization has been able to draw significant correlations between change impacts and customer satisfaction levels. This has since raised meaningful discussions regarding the approach of implementing changes and how to mitigate any potential negative impacts on the customer experience. It does not necessarily mean minimize on change impacts on the customer. Instead, it challenges the group to think through how to better engage and prepare for the customer to transition through changes. This is a great example of demonstrating the importance of linking change impacts with business outcomes. A lot of organizations treat change management as only discrete pieces of work that need to be carried out as a part of a project. With this approach, these organizations have hired mainly contractors with some permanent change managers purely focused on project execution. Whilst this work is absolutely required to successfully land initiatives, these resources come and go and at the end the organization is often no better off in managing change. Instead, there needs to be a continual focus on developing business change capability. This may be carried out in different ways. With each project implementation the change manager may focus on uplifting change management capabilities in the business within its leaders. Effective engagement and learning channels can be established to better aid the deployment of change initiatives. These include self-paced training systems, know-how regarding establishing and measuring various learning interventions, and different types of employee engagement channels, both face-to-face and digital. As change portfolio managers, a concerted focus on embedding business change capability can ensure that the business becomes more mature at undergoing change. A strategic plan can be developed that includes different ways of targeting capability uplift and change maturity. This requires business sponsorship and focus. It is also a critical part of effective operational management. Establishing effective change governance does not mean complicated multi-level governance with lots of documentation, policies and procedures and lots of head count to manage the processes. Change governance means having the right processes to ensure there is sufficient oversight and visibility on what changes are going to happen and the effectiveness of change delivery. Different organizations will establish different governance processes to suit the particular cultural and business environment. However, at the most basic level, there should be a regular cadence where managers can see and visualize the changes that are going to happen, and discuss any risks and issues with the picture they are seeing. At the same cadence there should also be a review of the previous changes and how they’ve been rolled out, with view to identify opportunities for improvement. There should also be different levels of change governance for larger organizations. For a business unit, there should be a change governance focusing on changes within the business unit. There should also be an enterprise level change governance focused on changes across the organization. At the enterprise level the discussion will be on strategic initiatives that run across the company. There should also be discussions on any risks and issues with business readiness and progress of the change. Examining the overall upcoming change slate and identify upcoming risks and opportunities. Opportunities may include potential gaps where there is very little change, and where there may be opportunities for initiatives to land. Portfolio project management manage the slate of projects using a structured process of funding, prioritization, analysis and review based on data. In a similar vein, so should change portfolio managers. The power that change managers have is not around cost or schedule data, it is on change impact and change readiness as discrete data points. The challenge is how to collect, analyze, present and leverage the power of these data. Is there too much change? What’s the change tolerance level for the business? How are various stakeholder groups impacted by the changes? How are initiatives under particular strategic themes impacting the business? How are customers and their respective experiences impacted by our initiatives? At a portfolio level, it is not sufficient to just focus on internal employee and stakeholder impacts. The change portfolio manager also needs to place focus on how are customers impacted by the planned changes. This drives at the core of the focus of a lot of the organizations on the customer. One large financial services organization that was focused on customer experiences started analyzing data on customer change impacts across initiatives. Through this, there was a significant realization that the same group of customers was impacted by 6 significant initiatives at the same time. Across each of these initiatives there was no coordination and the silo approach meant that poor synchronization and coordination could lead to a very poor customer experience. Subsequently, new roles and remits were created to manage this customer experience through facilitating a coordinated approach to planning and implementing initiative roll out. Iterative planning is a core of agile ways of working. At the core of iterative planning is the belief that we don’t always know the solution that we are striving for at the beginning of the change initiative. It is when we start testing and getting feedback from users that we are able to refine our proposal and be able to come up with a solution that suits the organization. To truly support agile ways of working, organisational change management needs to be able to develop prototypes of the change approach, and be able to morph or tweak the approach as required based on feedback. For example, a change approach can be tested on a particular team, the change champion group, or a selected trial group. Communication and engagement approach as well as learning approach can be tested in these groups. The Change Compass is a digital cloud-based change capacity planning tool. Get Change management and change impact analysis tools to manage strategic portfolio for the companies improve customers experience.